Tuesday again and it's raining again. This is the third Tuesday in a row that we've had rain. Is this a new trend? I could live with that! So far today we've gotten at least 1.2 inches which puts us close to 6 inches for the month. Our average in a normal year is around 4 inches, but, of course, we didn't get that in a single month last year. I'm liking this year a lot better! The combination of the rain and the mild winter weather has brought spring peeping over the windowsill in my garden. Everything is greening up nicely. I've already started pruning my roses even though the usual time to do that is still a couple of weeks away. It seems silly to wait though when they are already putting on new leaves and even new flower buds. I also did the initial pruning on the muscadine grape vines over the weekend, although I still need to go back and prune even closer. The vines do grow rampantly during the summer. Yesterday, we visited our local feed store and picked up some red potatoes for planting. I got them into the ground yesterday, before the rains started, so they've been well watered today, as have the radish seeds I planted. Cook the carrots in a pan with water on top of the stove until fully tender. Drain the water. Add the other ingredients and cook on top of the stove for a few minutes. Five minutes did it for me. Serve and enjoy. Carrots may be my favorite vegetable to eat - if not #1, they are certainly high in the top 10 - and one of my favorites to grow. I almost never have a failure with them. In addition to the potatoes and radishes that I planted yesterday, I also planted a few dill seeds in my seed starter tray under the grow light. Most of the seeds that I've planted there have sprouted and are doing well and I'm going to have a lot of new plants for the garden in a few weeks. 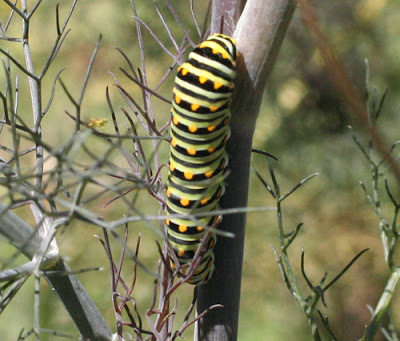 The dill is mostly for the black swallowtail butterfly. I had a good number of them in the yard last year, one of the few types of butterflies that were relatively plentiful in the garden in that drought year. They do love dill, as well as parsley, carrots and other members of the parsley family. I saw one in the garden again only yesterday. Tomorrow, rainy January will be a pleasant memory and it will be February. Time to get ready for the coming of the butterflies. Black swallowtail caterpillar on fennel, another favorite of their host plants. The National Wildlife Federation has worked together with ScottsMiracle-Gro over the past two years on programs to educate gardeners about global warming, connect children to the outdoors and help restore habitat following the Gulf oil disaster. Both parties recently announced plans for an even broader partnership that was based on our common interests. Since that time, Scotts announced a pending legal settlement related to events in 2008 that predate our partnership, which has made it clear that the partnership is not viable. Therefore, NWF and Scotts will work together to end the partnership in a friendly and mutually beneficial way. The "pending legal settlement" referred to is a lawsuit against Scotts for selling bird seed that had a chemical added to prevent insects from eating it. The problem was that the chemical was toxic to birds. Did they not see that that might be a problem? And did NWF truly not know about this before? What happened to due diligence? Anyway, partnership terminated. Maybe all those bloggers' knickers can get untwisted now, but I suspect there may be more announcements forthcoming from NWF. Resignations, anyone? Running hither and thither for appointments and meetings this week left me little time to actually spend in the garden. And then, of course, there was our rain day. On Tuesday, we got 2.7 inches of rain which puts us now officially above our monthly average rainfall for the first time in recent memory. The earth got a good soaking and all of the ponds in the area are now full of water. It is a wonderful thing to see. Around the garden, spring is beginning to creep in already. We've not had very much winter at all yet and plants that have died back to the ground in the last two winters are beginning to put out green shoots. The fruit trees, too, are convinced that spring is just around the corner. The pomegranate tree that I planted this winter is already full of these tender buds. My blueberries suffered terribly in last summer's drought and lost several limbs, but the limbs that remain are beginning to show some buds. I don't think my blueberry crop this year will be anywhere near as bountiful as it has in recent years, but it seems that there will be a few berries for my morning cereal. The cheerful blossoms of the Carolina jessamine are beginning to open. And the orange bulbine that has bloomed all winter continues to bloom. My bulbs never seem to do very well, but in the front yard, a few of the daffodils are sending forth some pretty, little blossoms. The signs of spring around my yard came as the USDA released its brand-spanking new 2012 hardiness zone map. When I went to their website and entered my zip code, I found that my garden had moved! My yard used to be in zone 8b, but with the new map, it is now in zone 9a (20 - 25F degrees for the low temperature). So without lifting a finger or packing a moving crate, I've moved to a more tropical zone. In fact, all across the country, gardeners are now finding that they are in a warmer zone. Thus does global climate change affect us all. National Wildlife Federation and Scotts Miracle-Gro: A green partnership or a sell-out? The National Wildlife Federation, sponsor of the backyard habitat program, has agreed to a partnership with Scotts, makers of Miracle-Gro, the non-organic plant food, and the most popular herbicide, Roundup. This has caused utter consternation among many in the organic gardening movement who have previously been supporters of NWF. The supposed aim of the partnership is a campaign to get kids outside and enjoying the real world of Nature and gardens, rather than being sedentary technoholics tied to their cell phones and video games. That certainly seems a worthy goal and Scotts is rich enough to provide money to back the campaign, but those in the organic movement see it as a marriage made in hell and accuse Scotts of trying to "greenwash" itself and its products by its association with what has been until now a respected conservation organization. NWF has received an angry and vociferous backlash from those who feel essentially that they have sold their soul to the devil with this partnership. I feel conflicted by this news. I am an NWF member and I proudly display my backyard habitat certification from them. Although I try to be as organic in my gardening practices as I can, I'm not pure as the driven snow in this regard. I have used Scotts' products in the past and I can't honestly guarantee that I won't ever use them again. When I have used them before, I've tried to use them sparingly and should I ever feel the need to use them again, it will again be only as much as I need to do the job. So perhaps this means that I've sold my soul to the devil right along with NWF and that I have no right to criticize them. In a perfect world, I would certainly prefer that my conservation organizations be unfettered by any doubtful associations. In the real world, I understand that it takes money as well as good intentions to do good. This is the compromise that NWF has made, trying to balance the good with the bad. It's a difficult line to walk and they have my sympathy. 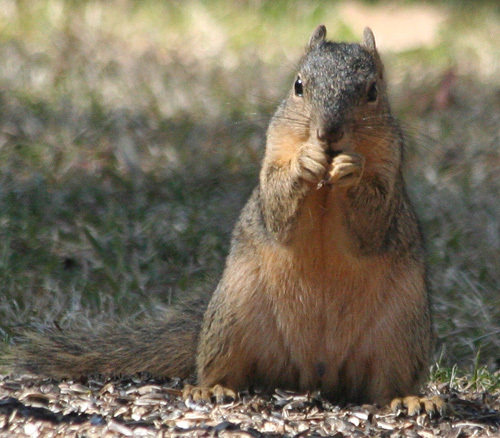 Squirrels tend to get a bad rap from some gardeners. They often dig where we don't want them to dig, nibble at our fruits and veggies when we'd prefer they didn't, dig up our bulbs, and eat the food that we'd intended for the birds. On the plus side, they can be quite entertaining with their acrobatic antics and some of us actually find them endearing. 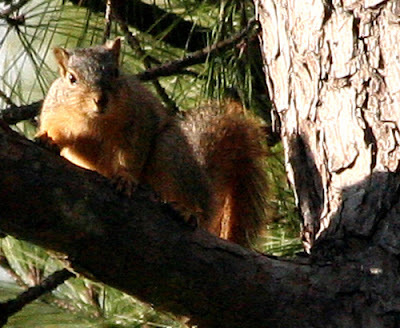 One such appreciator of squirrels is Christy Hargrove, a wildlife rehabilitator in North Carolina. Last year, she established the first Squirrel Appreciation Day on January 21. 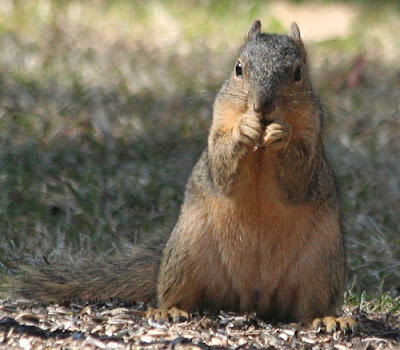 So, today, we celebrate the second annual Squirrel Appreciation Day. 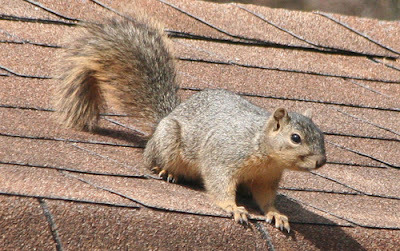 To get you in the mood, here's a link to a few pictures of some of the more than 200 species of squirrels in the world. The squirrel species that shares my yard is the fox squirrel and here are a few pictures of some of my lodgers. The post on the muscadine trellis makes a nice perch from which to view the backyard. 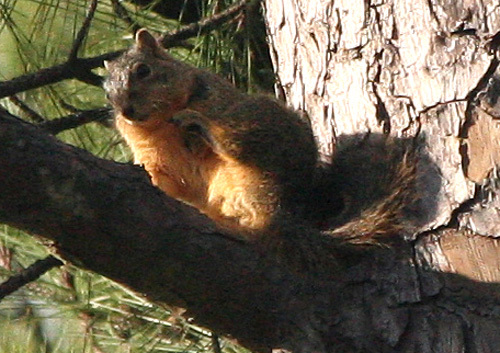 Squirrels enjoy the big pines trees in my neighborhood, many of which are now dead and some of which have already been removed. 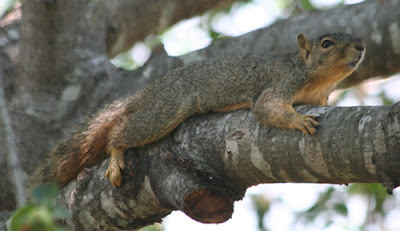 The old apple tree used to be a favorite place for a squirrel's afternoon nap on a hot summer day. The tree is gone now so he'll have to find another limb this summer. The area under the bird feeders always has plenty of sunflower seeds for a squirrel's snack. Always alert! 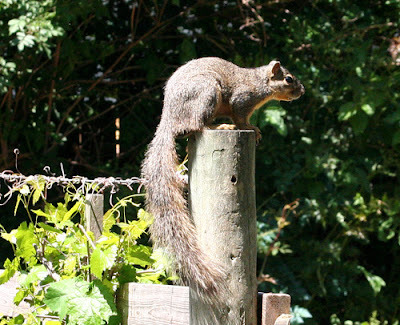 A squirrel has to be if he hopes to be long in this world. When a squirrel has an itch, a squirrel has to scratch! And when a squirrel's got a thirst, a squirrel's got to drink. 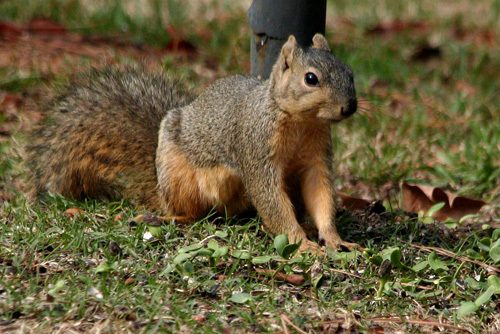 Take a moment to appreciate the squirrels in your yard today. Or if you can't bring yourself to appreciate them, at least tolerate them! How long does it take to ship a packet of seeds? Most of the seed companies that I deal with online are models of efficiency. When I place my order, I receive an email acknowledgement of it, usually within minutes. Within 24 hours, there will generally be another email either telling me that the item has been shipped or when it will be shipped, and I normally receive whatever I've ordered within a very few days. On January 4, I placed two online orders, one with Baker Creek Heirloom Seeds and one with Henry Field's. I received prompt acknowledgement of my orders from both places, and within five days I had received my entire order of 18 packets of seeds from Baker Creek. Around the same time I received an email from Henry Field's informing that the seeds and most of the other items I had orders would be delivered on January 13. The Jerusalem artichokes and strawberry plants I had ordered would not be shipped until March 3. It is now January 17, four days after I was told to expect delivery and I have received nothing from Henry Field's. According to the tracking, the shipment has been turned over to the postal service in Conroe for delivery and has sat there now for four days. Conroe is about 30 minutes from my house. I am extremely displeased with the service I have received which you can be assured I will make known to the company in question. There is nothing in my order that should have taken two weeks to reach me, and, needless to say, I will not be ordering from this supplier again. One good thing about the incident is that it just makes me appreciate even more those suppliers like Baker Creek who are efficient and timely in filling and shipping their orders. Well into winter now, my garden has seen three episodes of freezing weather. Each episode has lasted two days and has had temperatures of just below freezing. All in all, a very mild winter so far. Perhaps Mother Nature has taken pity on us after the horrendous weather she's given us over the last two years. Of course, there are still a couple of months of winter ahead and we may yet have more unfriendly weather, but so far, so good. January's Bloom Day finds my Southeast Texas garden basking in sunshine and relishing the moisture from recent rains. A gardener could not wish for more. Well, unless you actually want blooms. Truth to tell, blooms are still scarce here. Those who dally in bulbs are beginning to see their rewards in winter blooms, but I have few bulbs in my garden because I have little luck with them. The ones that I do have have yet to reward me with blossoms. So what blooms do I have to show you this month? There's the 'Star of Bethlehem' that I was given for Christmas. It's past its prime now but is still brightening my dining room with its pretty white blossoms. Outside, the shrimp plant, too, is past its prime. It has been in bloom for months now and still hangs onto its distinctive blooms, although they have dried a bit. The hardy purple lantana has been undaunted by our cold spells and continues to be a boon for visiting winter butterflies. In the vegetable garden, a few of the veggies that have been in the ground since early fall have bolted and started blooming. The bees are very grateful for these broccoli blooms. In a nearby bed, a few of the arugula plants are about to join the bloom parade. Can you guess what these dainty little blossoms are? They are radish blooms! They remind me of some of the flowers of scented geraniums. Along the south-facing brick wall of the house, the 'Big Momma' Turk's cap is still blooming. Orange bulbine is another tough little plant that can take extremes in cold or heat and still send out some blooms each month. This ornamental zebra grass bloom has dried into a seed head. The purple oxalis likes cooler weather and sends out its delicate little pink blossoms in winter. Solanum jasminoides, the variegated potato vine, is said to be a spring bloomer, but in my zone 8b garden it has proved to be a year-round bloomer. Leatherleaf mahonia is as tough as its name but in winter it covers itself with these pretty yellow, very long-lasting blooms. These blossoms will likely be present for the next couple of Bloom Days as well. In January, I'll even count a bloom from a weed, like this sunny yellow thistle blossom. 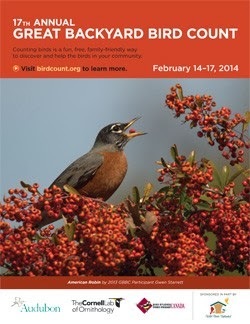 And in January - and every month - in my habitat garden, it's not just about the blooms. It's also about the wildlife that visits. This month, the star of the show is this female Rufous Hummingbird. Hummingbirds in winter are still rare enough to cause a bit of a stir here, but if mild winters continue, they may become more common in the future. I hope January is treating you and your garden well and that you are enjoying a very happy Bloom Day. Thank you for visiting. 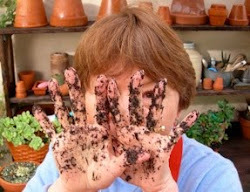 Don't forget to check in at the May Dreams Gardens blog where Carol, our wonderful Bloom Day hostess resides. It's been a great week in the garden, starting with 3.3 inches of rain on Monday. Since then, we've had mostly beautiful days, although the last two have been quite cold. I've marked several chores off my to-do list this week. I made major inroads on the weeding, got most of the frost-bitten plants cut back, moved several of the perennials to new beds, and started some seeds under lights. All in all, a productive week. What I need most right now are a few more weeks just like this one, including the rain. Then, my garden would be in good shape and ready for spring. Spring is just around the corner, you know. And then comes summer. In Southeast Texas, summer is never far away. It's a great day for ducks and for drought-tortured plants outside. So far, my rain gauge stands at 3.1 inches and the sky is still dripping a bit. While the ducks and plants might enjoy the raindrops, it's a good day for humans to be inside. A good day for getting those chores done that I've been neglecting while I worked in the garden. A good day for settling in my favorite chair with a good book. A good day for thinking about my goals for my life as a gardener this year. I don't have a great track record with making and keeping resolutions. Like so many people, every year I resolve to lose weight, get more exercise, adhere to a healthier diet and every year I soon stray from the straight and narrow. But gardening goals should be easier to keep, shouldn't they? After all, as I think about the resolutions that I might make, most of them would seem to make my life as a gardener easier and/or more interesting. 1. Start more plants from seed. I'm well on my way, having already received a good supply of seeds from my catalog orders. Many of these are varieties that I would never be able to find locally, so they should make my garden a more interesting place this year. I've got my light table set up in the garage. It only remains for me to get started. 2. Get a jump on the season. This actually is a corollary of #1. Starting plants from seeds will allow me to get them into the ground earlier before the sweltering summer heat hits. But getting the jump on the season also means being prepared to protect tender plants from late frosts, something I haven't always done. I'm a bit better prepared this year. Never let it be said that I haven't learned anything from the last two harsh winters we've had! 3. Be more prudent in my use of water. I don't have a sprinkler system, so I have to depend on hoses to deliver water to my plants when they need it. I would love to get a rain barrel system - just as soon as I can work that into my gardening budget. (Just think of how many barrels I could have filled today!) One thing I can easily do is invest in more soaker hoses, a much more efficient way of delivering water to the plants than sprinklers. I can also be more prudent in when I do my watering and I can lay on more mulch to help hold moisture in and keep the plants' roots cooler so they don't cook. 4. Spend more quality time in the garden. Although at some times of the year, it seems like I spend all my waking hours in the garden, I could organize my time more efficiently. For example, I am a notorious late starter in the morning. My most productive time of day is the late afternoon or after the sun goes down - not really the best circadian rhythm for a gardener, but perhaps I can reorder my days a bit and get more done in the morning hours. Then, maybe I could spend more time in the afternoons just sitting and enjoying my garden. That's important, too. 5. Use natural solutions to manage pests. Actually, I already do this for the most part. I do admit to an occasional use of Round Up, but perhaps I can even forego that chemical in my garden this year. 6. Do more to welcome wildlife. Of course, I already do this, too, as a habitat gardener and, again, this is a corollary to the previous resolution for wildlife are among the natural solutions for managing pests. But I'm always looking for more ways to make wildlife at home here. For example, there are other host plants for butterflies that I could plant and I'm sure I can find more ways to provide homes and hiding places for small reptiles and amphibians. They are all the gardener's friends, so it is in my interest to make them welcome. 7. Be more diligent about composting kitchen scraps. I was given a kitchen composting bucket as a gift last year and I used it for a while. Then we got an infestation of fruit flies that were swarming around the bucket, so I took it outside and never brought it back in. But I should be able to solve that problem and make more efficient use of kitchen waste. 8. Make better use of homegrown food. A certain amount of vegetables that I grow tends to go to waste through my laziness and neglect. Actually, that's not true. Nothing ever really goes to waste in a garden. SOMETHING uses it but sometimes it isn't me or my family. I resolve to try to do better this year and cut the losses. 9. Get more blooms into the garden. Nearly all my plants are perennials. I make little use of annuals, but these provide some of the most beautiful blooms available to a gardener and nothing welcomes a visitor to the garden more than colorful blooms. So, I resolve to plant some annuals among my perennials this year and to surround myself with blooms. 10. Be still and listen to Nature's wisdom and let it rejuvenate my spirit. It's amazing what one can see and learn just by being still, watching, and listening. The garden is my place of the spirit. I must not lose sight of that and I must be willing to hear what it is saying to me and to learn what it can teach me. I think 2012 is going to be a very good year! While at my local Tractor Supply store today replenishing my supply of bird food, I picked up the latest issue of Fine Gardening magazine. Austin garden blogger Pam Penick had mentioned in her blog recently that she had an article published in this month's magazine and I wanted to read it. After I got the magazine home and read Pam's article - which didn't take long since it is very short - I found that this particular issue is packed with design ideas that I can adapt and apply to my situation. Pam's bit, for example, details how one can go about systematically reducing the size of one's lawn. This is an idea whose time has come. More and more gardeners are digging out the grass and putting in planting beds with perennials, shrubs, grasses, even vegetables, so this article is very timely. Pam's main tip is to start reducing the lawn from the edges of your garden in, rather than doing island beds throughout the yard. Making long and wide curved beds on the perimeters of your yard is much more pleasing to the eye than chopping out a bed here and there throughout the garden. Other articles of importance to me in this issue of FG included a piece on designing with curved terraces, using chartreuse foliage to illuminate dark corners, and growing food in the shade. Another article of particular interest was about seed-starting myths and avoiding common mistakes when starting seeds. Since I hope to be starting a whole bunch of seeds within the next few days, I read this article twice! Did I mention that I got a shipment of eighteen packets of seeds from Baker Creek Heirloom Seeds in the mail today? It was Christmas all over again when I opened that package! I can't wait to get planting. I've written here several times in the last few months about my distress over all of the millions of dead trees that resulted from the exceptional drought we have suffered. Last month, I reported that some of the dead trees in my neighborhood were being removed. As much as one hates to see trees taken down, this was a very good thing, because if these mammoth trees fell in a storm, they could do a lot of damage. The tree that was of particular concern to me was not removed in December, however. It was the pine tree that was perhaps 120 feet tall and stood on the other side of our back fence in our neighbors' backyard. It was very close to the neighbors' house so removing it would be a delicate operation. Today that operation took place. At this point, the man with the chainsaw is over 100 feet in the air, held in place by his safety belt and spiked boots. He had removed all the lower branches of the tree as he climbed and now he is ready to take down the top section. The top of the tree is beginning to sway. Even though the top was down, there was still a lot of tree to be removed. It took the chainsaw man and his crew on the ground the entire afternoon to take the big tree down. As I worked in my backyard and watched him at his work, my heart was in my throat much of the time, but he obviously was very competent and knew what he was doing. That tree didn't have a chance. The tree had been a part of my life and a part of my view for all the years that I have lived here. I will miss it. My backyard will be sunnier on summer afternoons now, which is not really a good thing. But I expect my neighbors will rest easier knowing that the threat of that tree falling no longer looms over their house and I'm glad to know that it will no longer threaten my garden shed and vegetable garden. The man with the chainsaw has relieved our minds of that particular worry. Wordless Wednesday: Blooming broccoli beloved by bees! 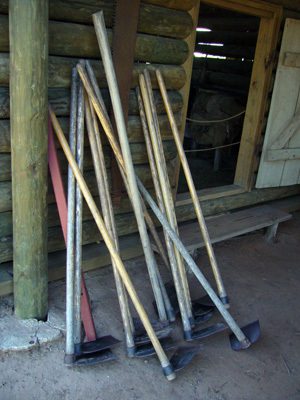 The New Year has started in very pleasant fashion for gardeners and gardens here in Southeast Texas. Our soil is moist from all the rains we had in December. The temperatures are cool but moderate and so far the sunshine has been plentiful. It's been quite a contrast to the starts that we've had to the last couple of years. Let us hope this pleasant trend continues. As the old year ended, my mailbox was being daily flooded by seed catalogs. Recently, I've spent a lot of time poring over them, trying to make the difficult choices of what to plant this year. I'm thinking particularly about the vegetable garden just now. I've decided to get some new seed starter trays with heated pads to get seeds started in my unheated garage. But which seeds to purchase? Tomatoes have been problematic in my garden the last couple of years. They just haven't done well at all. I'm looking to try something different this year. I have my eye on four heirloom varieties: 'Black Krim,' 'Rutgers,' 'Mortgage Lifter,' and 'Cherokee Purple.' None of them are varieties I'm likely to find in nurseries here, but if I start my own seeds, they should be ready to go into the garden by early March. True, I may have to give them extra protection from late frosts, but the sooner I get them growing the more likely they will be able to produce fruit for me before the REALLY hot weather gets here. That has been my problem in recent years. It just gets too hot too early. Once the temperatures are above 90 degrees on a daily basis, the plants shut down and stop producing. The heat is less of a problem for eggplants and peppers, but I want to get some of those plants started early as well, along with summer squash. Elsewhere in the garden, I need a blueberry bush to replace one that didn't make it through the heat and drought of last year. I also want to plant some strawberries and find spots for other small fruit trees in the yard. In addition, there are a few more perennials and shrubs that need to be moved and then it is time to start pruning and cleaning up the frost-killed plants. Truly, a gardener's work is never done, but on such beautiful winter days as today, it all at least seems possible. Even the weeding. Welcome 2012. Please be gentle with us.